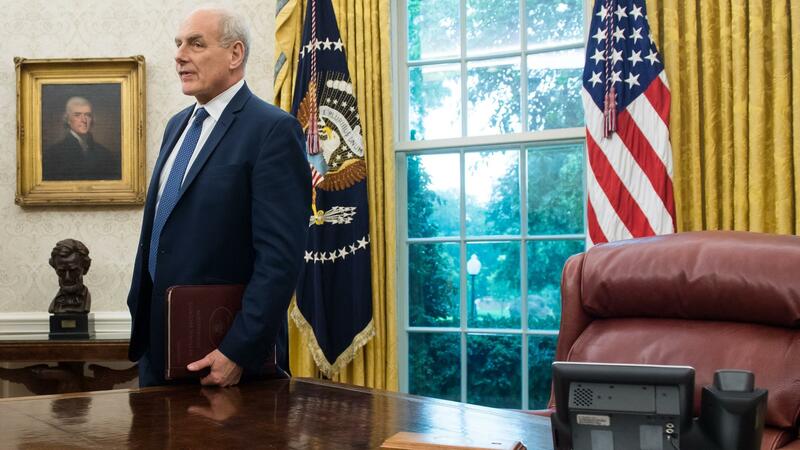 White House chief of staff John Kelly in the Oval Office of the White House Thursday. Kelly's recent comments about undocumented immigrants struck a nerve and inspired the hashtag #heyjohnkelly. In some ways, Kelly's statements contrasted with the inflammatory rhetoric of President Trump, who is under fire this week for calling some people who illegally cross into the U.S. "animals." Trump later clarified he was talking about members of the dangerous MS-13 gang. During the interview in his West Wing office last week, Kelly struck a different tone at first. "The vast majority of the people that move illegally into the United States are not bad people," he said. "They're not criminals. They're not MS-13." Then Kelly took a turn, reflecting the views of his boss, who wants a merit-based system of immigration. "They're also not people that would easily assimilate into the United States into our modern society," Kelly said of undocumented immigrants. "They're overwhelmingly rural people. In the countries they come from, fourth-, fifth-, sixth-grade educations are kind of the norm. They don't speak English, obviously. That's a big thing. They don't speak English. They don't integrate well. They don't have skills." Kelly's remarks come amid a fraught national conversation about the foreign-born in America. The White House wants to aggressively deport undocumented immigrants who are already here and block any more from coming; it seeks to slash the overall numbers of legal immigrants, favoring those with skills over those with family ties; it omitted "a nation of immigrants" from the mission statement of the U.S. Citizenship and Immigration Services. This is not the John Kelly I knew. Fifteen years ago, when I was an embedded reporter in Iraq, Brig. Gen. John Kelly spoke of invasion, not immigration. Standing outside the command tent, he briefed the journalists traveling with the headquarters battalion of the 1st Marine Division on the daily progress of the grunts' slog through southern Iraq on the road to Baghdad. Chemical weapon scares. Surrendering Iraqi guardsmen. Broken-down tanks. That's what he talked about. Today, at 68, the retired four-star general is the second most important man in the White House, controlling access to the president and acting as a powerful policy adviser in his own right. He is also mentor to Homeland Security Secretary Kirstjen Nielsen. That's why what he says about immigrants matters. Now Kelly's own family tree has become news. He grew up Irish Catholic in a working-class Boston neighborhood. After his NPR interview went viral, an activist genealogist named Jennifer Mendelsohn posted a page from the 1900 federal census. She says it shows Kelly's maternal great-grandfather, John DeMarco, was an illiterate Italian day laborer who spoke no English and did not have citizenship. Armed with this information, Mendelsohn created the hashtag #heyjohnkelly and asked people to tell their own family immigrant stories. Less than a week later, it has hundreds of posts. "The political controversy aside, this is a subject that gets people really excited," Mendelsohn said in an interview. "There's a thing that happens in people when you start talking to them about their family history. I see it over and over and over again." Kelly's deputy, Zach Fuentes, did not respond to a request to comment on #heyjohnkelly. Meanwhile, Mark Krikorian, director of the Center for Immigration Studies, which advocates for restricting all types of immigration, riffed on Kelly's comments for the National Review. He asked: Was Kelly right when he said many immigrants who come to the U.S. without papers are poor, have little education and lack English skills? Krikorian points to data from the U.S. Census and the Organization for Economic Cooperation and Development that show many Hispanic immigrants do have less than a high school education, they struggle with English and they're likely to be impoverished. "John Kelly's grandma is not really all that different from some woman coming over from Honduras today," Krikorian said. "What's different is us. We have a post-industrial, knowledge-based economy. We're talking about a 19th century-style immigration flow coming into a 21st century America." While the controversy over Kelly's comments continues online and in the media, the debate is as old as America. "This is what we call American nativism," says Roger Daniels, a historian of U.S. immigration, author and consultant to the Ellis Island Immigration Museum. "All this stuff you see, none of it is new," he says, "It's been around in great force since the early republic, and it's been perpetrated generation after generation." He adds, "It's a little more prominent now since they're getting encouragement from the White House."